MagicPedic.com is the only resource I know of for mattresses and toppers made using green foam with NO formaldehyde or bad chemicals. They are hypoallergenic and very comfortable and are made in the USA! Their specialty is green memory foam. 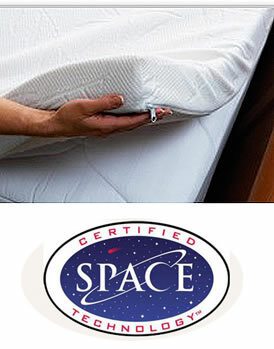 There are many manufacturers of memory foam mattresses and bed toppers available today. But these are the ONLY memory-foam mattresses I recommend. You can find the reasons for this in my health tip called Beds and Bed Linens. MagicPedic.com is an excellent resource for back and neck pain relief products as well. You will get a 3% discount off of the total cost of the products you order if, in their checkout process, you enter “PEPI” in the “Discount” section and hit “Apply”. Or you may give this code for the same discount if you call in an order. “I have been battling for years trying to find a green mattress that was comfortable. I always loved the feel of a memory-foam mattress but dared not to buy one because of all the chemicals. When I first got a MagicPedic topper, I wasn�t sure it would work for me. I�m really, really happy with this mattress. I love it!” S.M.